Hello my stampy friends!! It is Tuesday, so that means it time for me to host the 7KIDS Store blog! 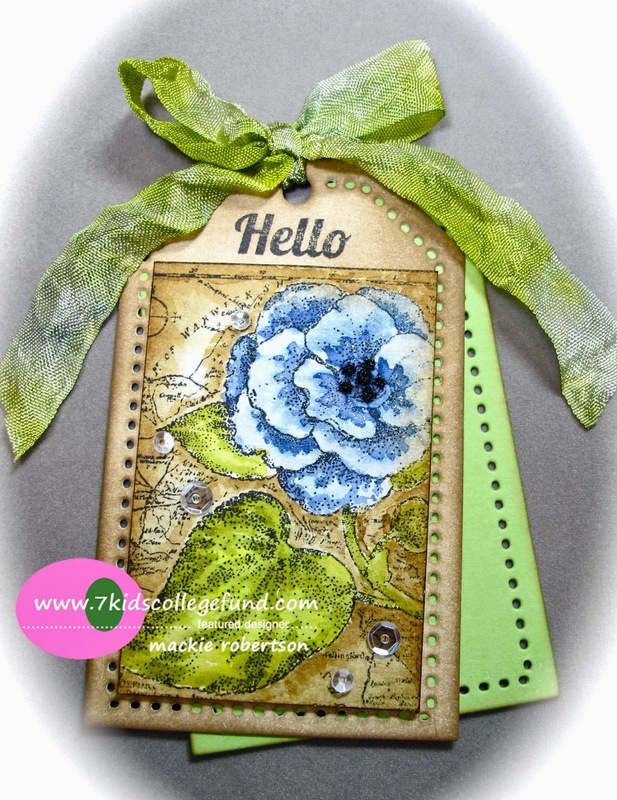 I decided to make a tag using Blooming Tags (Penny Black)stamp set. I stamped the image onto watercolor paper with Black Archival ink, and then colored the image with Distress inks and water. After coloring the image, I spritzed the left over inks with a little water. Then I dragged a piece of cream colored seam binding thru it. It made this perfectly matched ribbon for my tag! There is still time to join our current ANYTHING GOES Challenge ! You could win a $25 Gift Certificate to the 7KIDS Store! Gorgeous Mackie! The flower looks stunning! Wow! Gorgeous! Love your seam binding ribbon! Wow Mackie you've really knocked my socks off with this one, gorgeous! Gorgeous tag Mackie. Love the pretty image and the fantastic coloring. The layered tags look awesome. Gorgeous tag! Love the blk embossing and the inks used Mackie! OOOH! I LOVE the colored image and the seam binding trick is so smart! Fun to visit you again and see your creativeness, Mackie!